"Sanctus, sanctus, sanctus, Dominus Deus Sabaoth." 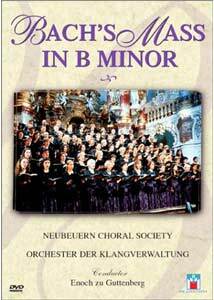 Bach's Mass in B Minor is certainly one of the towering achievements of classical music. This consistently amazing work, set in the rigid framework of the Latin Mass, transcends its subject matter time after time. Complex fugue after fugue hits the listener with hardly a chance to catch the breath before a double fugue follows. But the Mass is not a mere exercise in technical flourishes, but also contains some of the most beautiful moments to be heard in Bach. The performance on this disc is, in general, quite superlative. Using a smallish orchestra and only a modest-size choir, conductor Enoch zu Guttenberg leads a performance that is high on clarity and emotion. Particularly outstanding is the chorus, which has some of the most difficult music in the entire repertoire here, but is carried it off flawlessly. Enunciation is consistently clear, and phrasing is delicate, precise and nearly glowing at times. The vocal soloists are all quite good, although the baritone, Dietrich Henschel, has a few difficulties with the low range of his part. There are a few low F-sharps that he strains to reach, not entirely successfully. Contralto Iris Vermillion does double duty, taking on both the Second Soprano and the Alto parts. She does a very creditable job with them, and has an excellent stage presence that makes her the highlight of the vocal quartet. The instrumental soloists are without exception flawless and exquisite. The flute solo in Domine Deus is heartrendingly gorgeous here. The chorus and orchestra work well together in moments such as the beautiful mystery of the Et incarnatus est section of the Credo. Tempi are overall quite brisk, further challenging the participants, but the faster speed helps make the structures of the piece clearer, particularly in the fugal sections. The Sanctus is rather slower than I'd prefer, however, but certainly not out of the ordinary. The one flaw in the performance is the transition from the Crucifixus to the Resurrexit, which is a little on the sloppy side. It's as if all concerned knew that a very fast moment was to follow and some took that speed to heart a little too much. However, the ensemble rights itself within moments, none the worse for the experience. The orchestra and chorus perform the Mass in the Baroque Wieskirche in Bavaria. Pleasantly, the program is filmed without an audience, limiting extraneous racket. The camera moves around quite a bit, spending about a third of the time on the various details of the extraordinary church that is the setting. This disc is thus a pleasant visual experience as well as an audio one. Image Transfer Review: This 1998 program is one of the first classical music discs I've run across with an anamorphic widescreen picture. In general, this is much to the benefit of the presentation. Color is excellent and blacks are rich and deep. Detail is abundant throughout, extending even to the striking emerald green of Iris Vermillion's eyes. The one defect is that whenever the camera moves, there is a slight shimmer and the picture becomes somewhat digital-looking. More attention should have been paid to these moments during the mastering process. However, these moments are not too frequent and do not detract too badly. Audio Transfer Review: This disc has a wonderful audio transfer for a Dolby Surround soundtrack. The voices and instruments come through with extreme clarity, which is vital in a highly complex fugal work such as this one. There is no hiss or noise present that I could hear. Balances between soloists, both instrumental and vocal, and the larger forces are at all times precisely mixed to give prominence but not too much prominence. Bass extension is good, though not overpowering as is so often the case. There is some directionality, but not enough to distract one from the music. This is a nicely enveloping mix that should be a model for all others to follow, to show exactly how good a Dolby Surround track can be. Extras Review: Chaptering is quite outstanding; instead of one chapter for each movement as most DVD producers would assign, each submovement gets its own chapter stop, allowing the viewer to pinpoint a particular episode easily. Well done. This raises the grade from a stark D- to a D. Beyond that, however, there are no extras of any kind. Subtitles in Latin and English would have been welcome. An excellent performance (particularly by the chorus) of one of the most challenging and rewarding classical works, given a terrific audio transfer. Other than a little shimmer, the picture is very good as well. Alas, no extras, but recommended nonetheless for the performance.